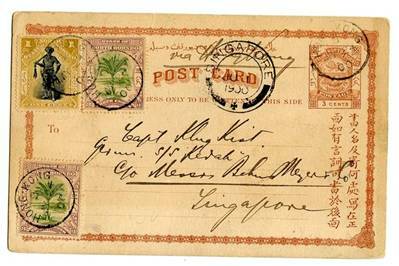 This postcard was written in Sandakan on 18 May 1900 and mailed that day or the 19th. Upon arrival in Hong Kong the stamps were cancelled with the current 24 May 1900 cancel. What was the name of the ship that carried it from Sandakan to Hong Kong? The only vessel that left for Hong Kong on 18th May 1900 was SS Mau Sang. Note the long route to Singapore via Hong Kong instead of going to Singapore directly. Nice card.